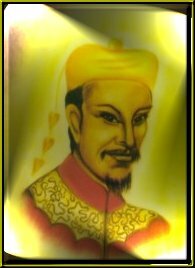 Lanto was the Emperor Chan of China during a time of great light and a magnificent age. It was said that He was, during the time of Confucius, a Chinese philosopher (551-479 B. C.), and that He made the Ascension at that time. He stressed honesty and integrity among the people which is still outstanding in China in spite of the de-graded, limited and fanatical conditions there today. These conditions in China as well as in India came about through the priesthood. Some of this perhaps was shown in the pictures known as “Fu Manchu”. The only hope to remedy these distortions is this release of the ever increasing Cosmic Light. Chan is a Chinese word for perfection. Lanto was a chela of Lord Himalaya. He stressed the expansion of the light in his heart during his development and intensi-fied it to a point to where it was visible through his flesh. He then insisted that it would never recede but would ever increase in intensity and forever be visible through his body. He accomplished that which no other Master of Earth has and in this respect He is unique among the Ascended Masters. Lanto was One of the Ascended Masters Who stood with the Ascended Master Saint Germain from the be-ginning of the bringing forth of this instruction to man-kind, that there were those in the outer world who could respond. The Ascended Masters do at all times cooperate One with Another, but They were not all aware and sufficiently familiar with the circumstances involved, being occupied in other fields. He has been in charge of the Retreat in the Grand Teton for a long time and was the presiding Master at the Conclaves held there. He is now prepared to go on into greater service. The Being known as Confucius was prepared and ready to take His place, but Lord Lanto decided to remain until the change of the axis. However, He did relinquish this position and assumed Chohanship of the second ray in July nineteen fifty-eight, instead of going on into greater spheres of service. His particular quality is reverence of life—creation. His keynote is “0h Thou Sublime Sweet Evening Star” from Tannhauser. He uses the fragrance of sandalwood. Lord Confucius assumed the position of Hierarch of the Teton Retreat after the ceremonies held there on the Fourth of July. He is also on the second ray. Now you have the chance to be initiated into the Lanto Energies. They will envoke in you the energy vibration of Lanto. You will receive 2 attunements, a Lanto Chakra Oil and a manual. The first is the basic ALL Ascended Master Attunement. The second is the specific Lanto attunement.